What would it be like to live inside a video game? Most Japanese litRPG anime and light novels are aimed at an early teen audience, following eighth-grade protagonists through simple power fantasies. But what adventures might await the adults who form a majority of the MMO player base? Log Horizon, the multi-media franchise based on the light novels by Mamare Touno, takes up the challenge, simultaneously delivering a World of Warcraft/EverQuest-inspired game world that, for once, resembles current MMO gameplay while challenging its characters with the social quandaries and responsibilities that twenty-something adults encounter. By eliminating the hoary convention of death in the game world resulting in death in real life, Log Horizon forces the players to deal with each other and the inhabitants of the world. The result is a richer story absent of the false drama caused by player death. For twenty years, the MMO Elder Tales has been the most popular and ambitious MMO, eclipsing even World of Warcraft in its player base. As Elder Tales’ twelfth expansion, Homesteading the Noosphere, rolls out, a socially awkward engineering graduate student known as Shiroe finds himself trapped inside the game along with hundreds of thousands of players worldwide. As the trapped players struggle to adapt to the new reality inside Elder Tales, a growing malaise, poor food, and decaying relations with the non-player characters known as The People of the Land cloud the game world. Together with his friends Naotsugu and Akatsuki, Shiroe sets out to rekindle hope and create a place that the gamers can call home. The end to this quest will not be found at the bottom of a raid dungeon. While Log Horizon is best known over here for the anime, manga and light novel versions exist as well. Yen Press is publishing an excellent English translation of the light novels, with the latest scheduled for English release in January 2019. Since such a tale of alliances can leave a cast sprawling and characterization thin, two manga spin-off series cover the adventures of guilds allied with Shiroe, The West Wind Brigade and Honey Moon Logs. 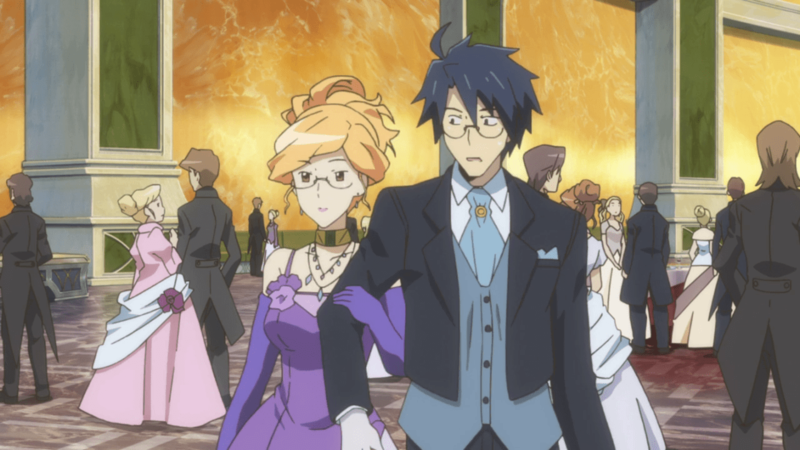 Log Horizon’s characters come from the full sweep of MMO players, including busy professionals blowing off steam, the chronically ill who find in gaming worlds to explore that are otherwise denied them, and the introverts, the socially awkward, and the wounded hearts which find socializing in gaming easier than real life. Shiroe is a renowned master strategist among the player base, seeking the most harmonious path through the entangling politics, but he is vexed by his own doubts and the nagging suspicion that most people only show interest in him to mooch from his talents. Because of these doubts, Shiroe tends to withdraw from polite society and potential sources of social conflict, such as player guilds. But to protect his friends and adopted hometown from the perils of the new Elder Tales world, including other players, Shiroe has to steer into situations he once avoided, and use his considerable talents for someone other than himself. Fortunately, he is backed by his longtime companion, Naotsugu, a cheerful skullcracker in Elder Tales and a successful salesman in the real world. The brawn to Shiroe’s brain, Naotsugu also thrives in the social circles Shiroe would rather avoid. Too bad Naotsugu’s occasional bouts of exuberant immaturity often undermine his successes. While university student and avid role-player Akatsuki is the mascot character for Log Horizon, she is also a highly competent ninja who is also plagued by insecurity caused by her short stature. Practically invisible to all but children, she desperately wants to fit into an adult society that is denied her in the real world, but is unsure of how. Likewise, each member of the tangled mesh of guilds that Shiroe calls on for his schemes carries both success and burden. Unfortunately, the sheer scope of the intrigues does not always allow for the characterization of these conflicts of self to be painted in anything other than broad strokes. Compared to the exuberance of moe shows, the character designs are less exaggerated and more refined, depicting a wide range of ages without resorting to the old trope of depicting all adults, including university students, as late middle-aged or older. The teen supporting characters are depicted with an awkward earnestness missing from the age-of-consent fantasies cluttering isekai and anime. By the way, whoever at Sentai Filmworks it was that turned the gentlemanly swashbuckling cat Nyanta from an infestation of meow puns into the gamer version of Lando Calrissian needs a raise. The litRPG genre can be daunting to outsiders. Log Horizon attempts to ease the audience into the complexity of an MMO. The rules of the world encourage Shiroe and the gamers to use the menus and obvious gaming controls as little as possible. The best results come when players actually use their bodies to swing swords and craft items instead of relying on menus. This all but eliminates the rules crunch that turns off many from litRPGs, leaving only trappings such as HP and MP as occasional reminders of the game. The few times MMO mechanics such as the eternal nature of the player characters intrude on the story, they become actual plot points instead of distractions. MMO encounters and strategy, such as threat, taunting, roles, groups, dungeons, and raids, are explained at an introductory level, necessary for non-gamers, but remedial for the gamers that Log Horizon appeals to. However, the MMO stylings exist only to provide a framework for the intrigues and alliances necessary for Shiroe’s plans. But what sets Log Horizon apart from its light novel and anime contemporaries is in how it deals with its setting. A survey of isekai light novels will quickly reveal that the genre is dominated by burned out salaryman nostalgia for high school or the attempts of the socially awkward to recast their high school experiences into how they think high school should have been. (Western YA is also plagued by the same backwards-looking approach and suffers as a result.) This creates YA books aimed at adults instead of teens, often filled with age-inappropriate humor and outright fetishes. Log Horizon instead provides a more aspirational approach. In articles covering her Rachel Griffin YA series, L. Jagi Lamplighter pointed out the children and even adults don’t want to read stories about people their age and younger, but instead devour stories of the next stage in life. Log Horizon exemplifies this idea in a rare story revealing the responsibilities and expectations of young professionals to high school and university students. As leaders in the evolving order in Elder Tales, Shiroe and his friends exhibit the leadership, mentorship, composure, bravery, selflessness, and sound judgement expected from adults, channeled into the admirable goals of protecting the weak, preserving the peace, and promoting the greater good. Shiroe’s machinations are designed to benefit all parties involved, rather than indulging the blatant self-interest seen in many teenage power fantasies. But to fit within the emerging society, Shiroe, Akatsuki, and many of the other characters have to overcome doubts, misgivings, and fears to rise to the challenges. And when they fail, they pick themselves up and try again. This is not accomplished through overt messaging, but demonstrated through action and consequence. The selfish, cowardly, and rash cause chaos, while the selfless, brave, and deliberate earn a hard-won peace. And, most importantly, being an adult is fun and desirable. And that is a rare sentiment in an entertainment world increasingly flooded with the adventures of adults who want to be teens. My big problem with it is the same problem I always had with these stories. A couple episodes in and apparently none of our protagonists have lives in the real world. No families. No girlfriends or boyfriends or friends or any sort of fulfillment. They’re just…there. As always in this genre. LH does start to deal with that in the second season, most notably with a man who keeps dying in the game game because the resurrection process for adventurers is the only time he can see his fiancee. But a good portion of the main group of characters don’t have those real world connections because they’re, well, damaged goods. The no families trope is not unique to isekai. Maybe when the entire medium grows up a bit. Responsibilities and parents seem to be the first things to go in a burnout fantasy. It doesn’t ring true. Soooooo many people, all of our protagonists, trapped in this world, and none of them are desperate to escape? Nobody has any sort of life waiting for them? Even the dude in his mother’s basement has a mom. For all of SAO’s flaws at least people were trying to get out. Dealt with, in story, but later. Realms of Akron does it the opposite way. Tons of people join the game so they can be with their loved ones trapped in the game. But to be honest, I am of the opinion that having no life outside of gaming is the hallmark of an mmo player. They require to much commitment and interfere in real life to much. Yes you can have a real life but you won’t be a top tier or even high tier player. Incidentally, the fact that these people are adults, and thus have their whole lives to form relationships, does not help matters. They, especially, should have something to lose.